Beginning the week of February 4, night work begins. Construction hours are Monday - Thursday, 7 p.m. to 5 a.m. Expect single lane traffic with flaggers. Evening work will be suspended on or before Memorial Day and resume after Labor Day. Pedestrian access will be available on one side of the bridge at all times. There will be lane closures at night, with flaggers. Expect delays of up to 20 minutes. ​Expect intermittent lane closures. Single lane closures will be allowed at night when traffic volumes are lower. Temporary traffic control will be in place to guide travelers through the work zone. Sidewalks on each side of the bridges will be closed periodically. Temporary, accessible pedestrian routes will be provided to direct pedestrians around the work zones. Access to nearby businesses will be maintained at all times. 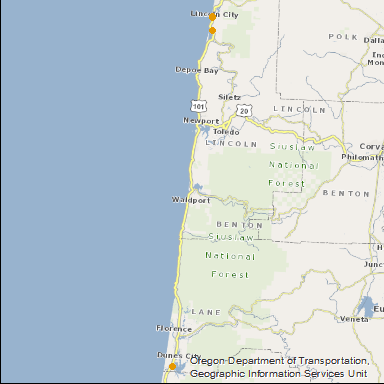 Check TripCheck.com for construction status and current travel conditions. Hydroblasting the bridges to remove the bridge rails for replacement and spraying zinc coating for the cathodic protection are noisy. Neighbors will be notified of construction schedules and what to expect. An open house was held August 22, 2018, in Lincoln City. ​Work began on the D River Bridge in September 2018. Schooner Creek Bridge is scheduled to begin in early summer 2019, and Siltcoos River Bridge begins in spring 2020. ​Construction is scheduled for 2018 - 2021. Summer construction hours: 6 a.m. to 10 p.m.
June 1 - September 1: no work allowed 10 p.m. to 6 a.m.
​Three bridges will be repaired and updated, including removing and repairing corroded bridge structural pieces and railings. Cathodic protection will also be installed. ​These bridges have deteriorated from the salt air on the coast and are in need of repair. If nothing is done, the bridges would eventually have to be replaced. They might also need to be load rated, meaning that large vehicles over a certain weight would not be able to travel over them. ​This is one of a series of bridge cathodic protection projects along the Oregon Coast, designed to keep the structures in service for years to come. ​The bridges will receive titanium and steel reinforcements on the bridge deck and along the girders under the bridge to strengthen them. This will require cutting narrow slots and drilling small holes to insert the reinforcements, which will then be secured to the bridge with an epoxy. Bridge rails will be replaced with new rails that meet current standards. A variety of methods will be needed to remove the old rail while not damaging portions of the bridge that remain, including chipping and hydro-demolition. The bridges will also receive cathodic protection, which provides a shield of protective coating to prevent the steel from corroding.